Astronomical observations are naturally very sensitive to light pollution, which is why you typically place observatories in desolate locations. Even there, you are not guaranteed success, as someone may turn on the light in the dome, shine a flashlight towards the telescope etc. meaning that your observations will be ruined. Young George Coyne was observing at the Vatican Observatory in Castle Gandolfo, when someone opened the door to the observatory and let in a lot of light, ruining the exposure. George shouted “close that bloody door”, after which the visitor promptly vanished, closing the door behind him. George then continued his observations for the remainder of the night, without further interruptions. In astronomy, we sometimes make discoveries that really make us scratch our heads. Observations that appear to contradict what we believe we know about the Universe. These kind of discoveries are always exciting, as it gives us an opportunity to learn new things about the Universe, and gain a deeper understanding of the world around us. It is certainly something that most astronomers hope for, at some point in their career. That whatever you are researching into, does something unexpected. I mean, who wouldn’t want to have your name associated with a new astrophysical phenomenon? Thus, one can imagine the excitement, when, in 1962, the French astronomers Daniel Barbier and Nina Morguleff looked at a spectrum they had taken of the G5 dwarf star HD117034 (yes, we’re good with names), and observed two bright emission lines of neutral potassium. A spectra taken the following night, showed no sign of these emission lines. They quickly wrote a summary of their observations and announced the discovery of this new class of “potassium flare stars” in the Astrophysical Journal. It is not an unknown phenomenon that low-mass stars exhibit flares. These intense, short, outbursts of energy we know even from our own Sun, the solar flares, which are typically followed by coronal mass ejections. However, flaring stars often show emission lines from multiple elements, like silicon, iron and oxygen. Thus, it was a surprise to discover this new class of stars, that seemed to show emission only in the same two potassium lines. Over the next couple of years, another two potassium flaring stars were discovered, both observed from Observatorie de Haute-Provence, as was the case for the initial discovery. Again, the potassium emission lines were only visible in a single spectrum. Adding to the mystery was the fact that the three flaring stars were of wildly different spectral types, namely a G5 dwarf, a K7 dwarf and a B9 dwarf, where particularly the latter stands out, as B-type stars pumps out a lot of energy, meaning that potassium should be fully ionized and no emission lines from neutral potassium would be expected. Nevertheless, since this had now been observed in different stars at different times, it would appear that a real, transient, astrophysical phenomenon had been discovered, although no one was able to explain it. This spawned a lot of interest, and an extensive search was carried out by Robert F. Wing, Manuel Peimbert and Hyron Spinrad at Lick Observatory, to discover more of these mysterious objects. Although they surveyed 162 stars, not a single potassium flare was observed. Thus, the head-scratching began. Had the astronomers who discovered the three flare stars just been incredibly lucky and made a serendipitous discovery? Or might the explanation be something a bit more down to Earth? It had previously been suggested that the emission lines could be originating in the Earth’s atmosphere, but in this case the emission lines should have been very narrow, which was not what was observed. The astronomers at Lick Observatory then began looking for other sources of potassium emission. After some experimentation, it was found that the observed emission spectra matched quite closely the spectra of ordinary matches, if the light from the matches were able to reach the spectrograph. Several different types of matches were used, and all produced similar results. The same thing was also tested at the Observatorie de Haute-Provence, and it was found that, in certain positions, the light from the matches did indeed reach the spectrograph. The full paper can be read here. Thus it would appear that the potassium flaring stars was in reality a potassium flaring member of the observatory staff, who had lit up briefly in the science literature. Following this, I bet this observatory may have been the first to see a smoking ban on the premises. Or at least anywhere near the spectrograph. This is also a perfect example of how astronomy, and science in general, works when something weird and unexpected it found (remember the super luminal neutrinos?). Such findings need to be independently confirmed and checked rigorously, to rule out other potential explanations. In many cases these things can be explained by already known phenomenon, or an overlooked mistake somewhere, but sometimes genuinely new things are discovered, which is amazing! As a side-note, the extensive testing of the spectra of matches also showed that French and American matches were very similar products, in terms of composition, so there’s no blaming foreign matches when you can’t light your fire. Blame the animals, it wasn’t our fault! At the very least, that snake will not be interrupting the observations again in the future. If you are interested in the actual outcome of the observations, the paper can be read in full here. 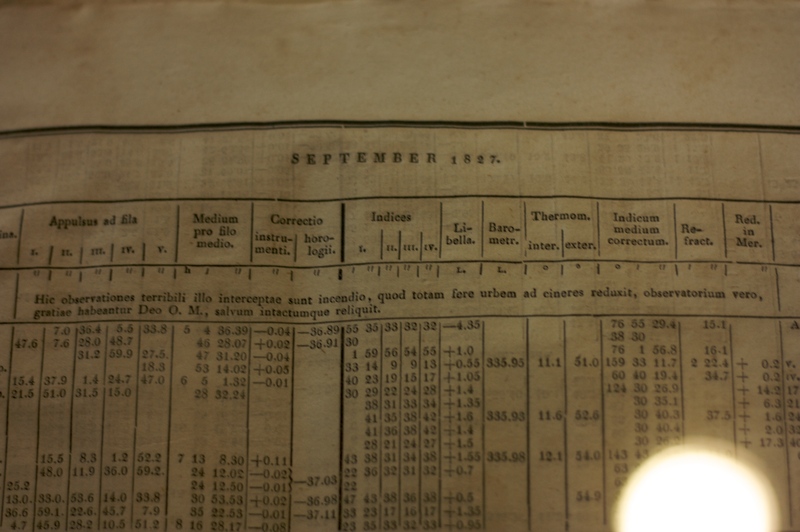 Argelanders’ observing log on display at Helsinki University. Photo credit: Olli Wilkman. “Here the observations were interrupted by a terrible fire, which reduced the entire city to ashes. The observatory was, thank God, spared.” A couple of days later the astronomical observations continued as normal. One could argue that most other people would likely have a rather different opinion on what should be considered important during such a disaster. After the fire the university was moved to Helsinki, where it remains, now called the University of Helsinki. Getting too attached to your work. When observing with telescopes, a fairly fundamental requirement is that the telescope dome is open. This will also mean that whoever is inside the dome, will be exposed to the elements, which may require some special precautions. In particular if you are observing in the colder parts of the world. Like, for instance, Poland. The winters in Poland can get quite cold indeed. But this will not hold back the dedicated astronomer from braving the elements to get some much needed observing done. This was the case during a particularly cold night at the observatory, where the guiding of the telescope is done manually, by looking through an eyepiece. As astronomical exposures are often rather long, this eager scientist had to guide the telescope during the full 30min exposure he was performing. Luckily for this guy, he had quite some acrobatic skills, and very flexible body parts, so after fiddling around for a while, he managed to unscrew the entire eyepiece and carry it with him inside, resting it on a table for another 15 minutes, before the entire thing had defrosted and could be removed from his eyebrow. This amount of dedication and attachment to your work is rarely seen and definitely deserves sharing with the world. When doing observations, it sometimes happens that things just won’t collaborate, one way or the other, making it impossible to get any good data. This is true for all areas of astronomy, where you can have clouds, high water vapor, light pollution, radio frequency interference or equipment malfunction of various sorts. Sometimes the reasons for not getting observations are tricky, but in other cases they are fairly obvious… Or so you would think. 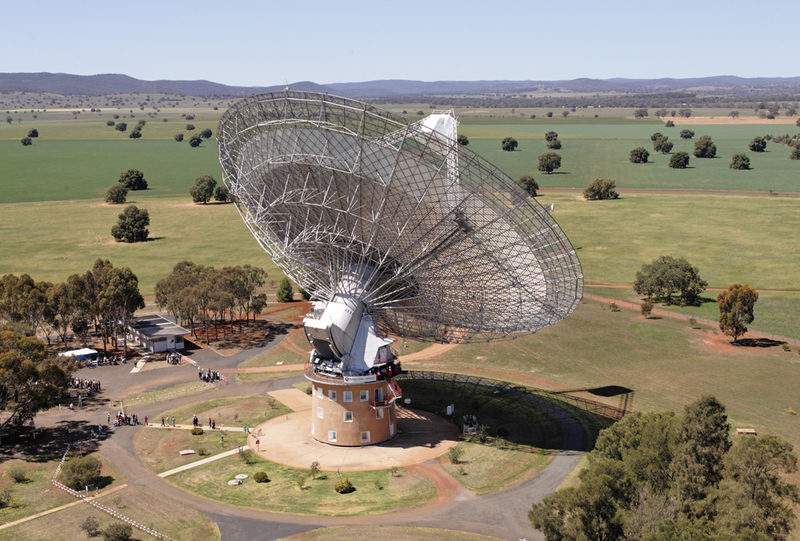 Doing a pulsar survey one night at the Parkes Observatory, an undergrad student observer doesn’t seem to be getting any good data from the 64m radio telescope. In fact, he’s not even getting bad data, he’s getting no data at all. As much as it is annoying getting bad data, getting zero data is just immensely frustrating. The bad data would at least get you something that could potentially be useful. But having gone through all the planning and work associated with observations, for zero gain, is just painful. After long hours that no doubt involved pulling out hairs and being frustrated, the relief, which happens to be the supervisor of the undergrad student, enters the observing tower at 4am. He’d apparently been keeping an eye out for things on the ground on the way there, as he had found a receiver lying on the ground outside. His immediate reaction was along the lines of “Huh, I wonder what that’s doing here? I better pick that up and bring it in with me.” The receiver was then brought to the control room, after which the supervisor continued to try and get some observations going, with very limited success. At sunrise, one of the staff members arrive, to meet what was no doubt a very frustrated astronomer, who had not gotten any useful data at all that night. Upon seeing the receiver in the control room, he casually pointed out that there was a very nice receiver-shaped hole in the radio dish. In fact, it looked suspiciously like the receiver the supervisor had picked up during the night, would fit exactly there. Which of course provided an immediate explanation as to why no data was received. One can only wonder, why this had not come to mind earlier. I suppose it’s like when you are looking for your glasses while already wearing them. You just don’t see what’s right in front of you. Apparently, the receiver had recently been changed, and whoever was putting the receiver in, had not tightened the bolts sufficiently, so as the telescope was turning, the receiver had gotten loose and fallen to the ground. I suppose that the lesson here is: If you find a fairly essential piece of your instrument in a weird place, that might be a good place to start, when trying to figure out why nothing is working. In addition to that, some safety advice; Always wear a hard hat when observing. Even if in the middle of nowhere, with no tall things around, you never know what might hit you.